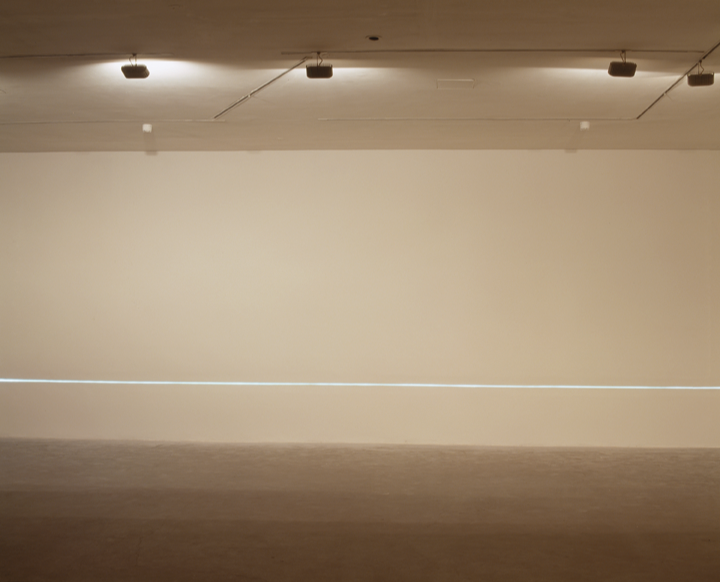 The exhibition consists of a number of works which address the periphery of the gallery or extend through the gaze of a figurative sculpture or a reflection on a window, beyond the very boundaries of the walls themselves. 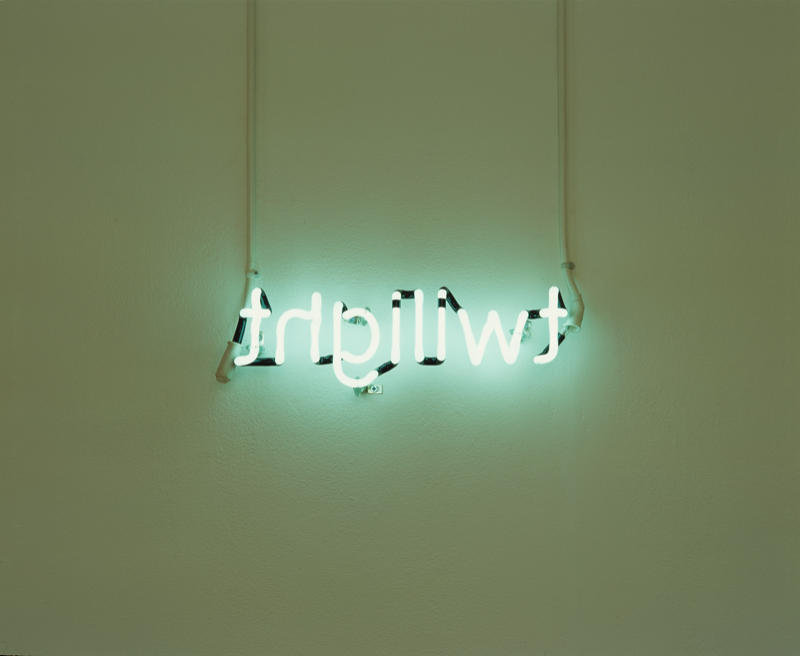 On entering the gallery, the first work seen is a white neon of the word ‘Twilight’ which is written in reverse. 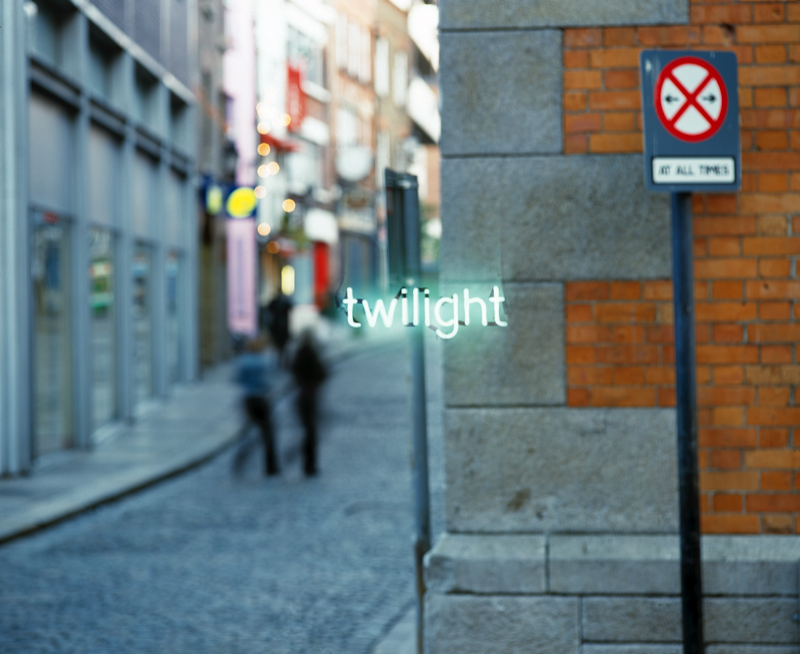 "‘Twilight’, a neon text written backwards, can be read correctly only in the reflection on the glass of the gallery's window. 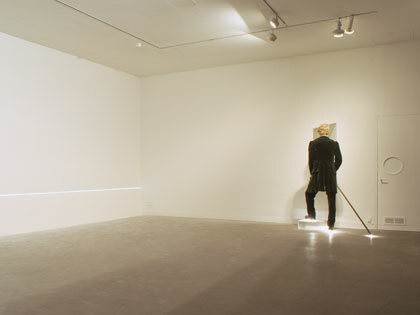 At the opposite side of the gallery, facing into a small internal window between the gallery and the hallway,a life-size figurative sculpture ‘The Wanderer’ stares mutely out. "Walker and Walker’s ‘The Wanderer’, a fibreglass life-size figure dressed in a velvet replica of a nineteenth-century suit, (which) is based on Friedrich’s painting ‘The Wanderer Above the Sea of Fog’. In Friedrich’s painting the solitary figure stands before sublime nature and above not only the sea of fog, but the rest of humanity. None of Zarathustra’s contempt or Sardanapalus’ disregard for the life of others is evident in the painting, but the wanderer is elevated, heroic, separated from the social body, a man apart. His outfit already fixes him as otherly, existing outside the norm. In Walker and Walker’s replica, the elevation of the wanderer is a miniature of the mountainous heights of the original, and yet more miraculous still: the figure levitates 5cm above the ground. Here is the separation of the Romantic sensibility – palpably, visibly evident. The horizon was extremely important to the Romantics, for them it signified a site of new possibilities. Romanticism ushered in a new conception of the artist as self-fashioning, self-determined and independent. Being thus liberated from history, tradition, convention and social mores, Romantic artists set out to establish their own horizons rather than be commanded by inherited limits. A final sculpture titled Drawing, Nature Study is a 3D rendered sculpture of a little known drawing ‘Nature Study’ by Casper David Friedrich. 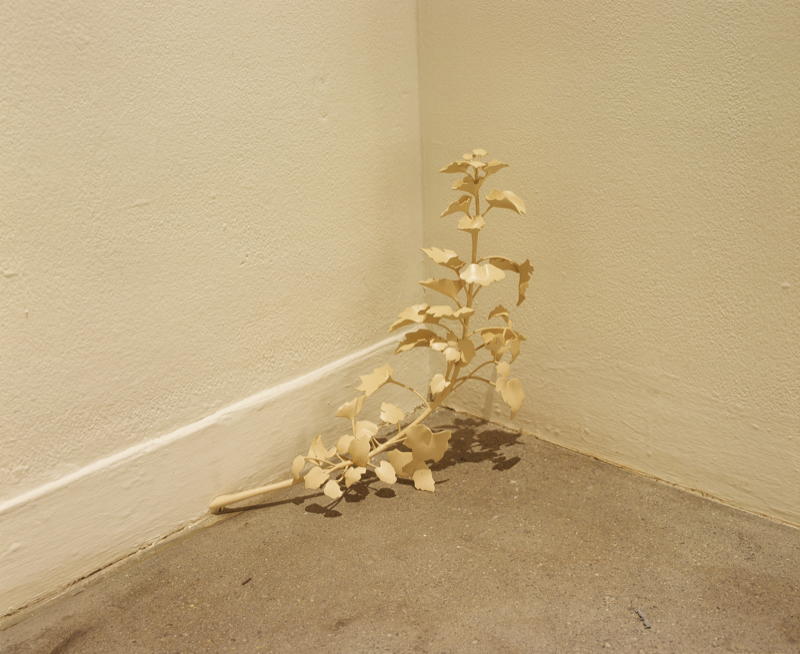 The sculpture which is made from carved resin is placed in the vicinity of a corner and has the appearance of a weed growing out at the base of the wall.